These are lyrics by 10,000 Maniacs that we think are kind of funny. 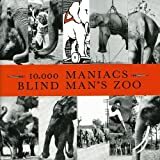 10,000 Maniacs', "What's The Matter Here?" Slap you, slap you silly. The song, itself, isn't funny. However, this line is amusing to me because the first several times I heard it, I didn't think mind as in 'listen to me.' I heard the song saying, 'If it's okay with you, I will beat on you.' Now, I find this portion amusing.